The wait can seem endless! The day you choose your new Savannah kitten to the day your new family member comes home can feel like forever! But fill the days by preparing for your kitten’s all-important arrival and time whizzes by. So now is the perfect time to mentally prepare yourself and physically prepare your home to make your kitten’s transition as smooth as possible. It is important to understand that placing a Savannah kitten on an airplane is not much more stressful for a kitten than driving him or her a few hours to a new home. What is stressful is the confusion of being taken from his or her former surroundings and separated from his or her siblings, the constant companions your baby has been used to playing with, eating with and sleeping on 24/7 since birth. 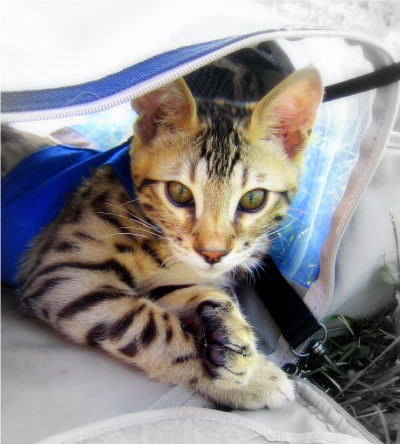 When your Savannah kitten first arrives, we recommend you have a small room ready for him/her, such as a bathroom where your kitten can’t hide under anything, where food, water and litter box are all readily accessible, and allow your kitten to come out of the carrier on his/her own. Some Savannah kittens will barrel out as soon as the carrier door is opened. Others are less confident and may require coaxing. You’ll find a feather teaser toy has been attached to the carrier to help entice your kitten if he or she needs a little cajoling. Once out of the carrier, allow your new baby time to explore the room. Gently place him or her in the litter box (see: Litter and litter boxes below), and point out the location of the food and water bowls. Offer your Savannah kitten a small amount of wet food. See our Feeding page for more information on suggested wet food. The best way to win a Savannah kitten over is with a toy! They can hardly resist feather toys. Take the time to sit on the floor with your kitten, at his or her level, and play with your Savannah kitten. This will quickly help form a bond between you. However, once finished playing, place feather toy, and toys with cords, out of reach. Feathers and cords are too tempting to chew on and swallow. Savannah kittens usually choose to crawl up onto your bed to sleep with you. If allowed, your kitten will feel very comfortable and will bond more quickly with you. However, Savannah kittens will sometimes wake up groggy, sense the soft, squishy feeling of the comforter/mattress, and, without thinking, relieve themselves. So be aware of the “waking kitten” and place him or her in the litter box as soon as baby starts to stir. If you have other pets in your home, we recommend waiting until your kitten is completely comfortable and bonded with you and your family before introducing them. 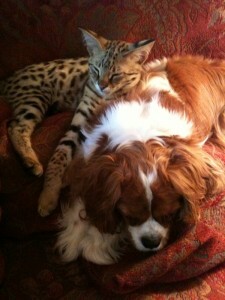 If introduced too quickly, your Savannah kitten could bond more closely with your other pets than with your family. If you do have other pets, a five-day minimum quarantine period for your Savannah kitten is imperative. This protects your kitten as well as your other pets from “picking up a strange bug.” Since kittens are stressed during a transition period, their immunity is generally weakened and they are more apt to succumb. While it is common for an adult animal with a strong immune system to carry viral strains that don’t affect them, a Savannah kitten with a weakened immune system, exposed to the same virus, could easily contract the virus. So keeping your kitten separate for a minimum of five days is very important. Once your Savannah kitten is comfortable in the small room, he/she can be allowed access to more of the house. Starting with the master bedroom that connects to your kitten’s bathroom, is ideal. When your Savannah kitten readily comes to you to play and socialize, you can permit him or her more run of the home. And once your kitten has run of the house, we recommend keeping several litter boxes throughout the house for the first couple of months. As your Savannah kitten starts to explore, be sure to set him/her into the new litter boxes several times during the first few days. Even with multiple boxes available, we recommend you give your kitten time-out sessions in his or her original bathroom/bedroom to encourage your Savannah kitten to take time to eat and drink and use the litter box. See also: Dangerous cords and poisonous plants as well as More Childproofing below. To prevent confusion, use the same litter your Savannah kitten has been used to at Savannah Cat Breed, Feline Pine, a pelletted pine litter with a completely different scent and texture than clumping litter. If you choose, after a week or so, you can begin mixing the pelletted litter with a clumping litter to get the kitten converted to the litter of your choice. When your Savannah kitten is very comfortable and familiar with your home and uses the litter box without incident, you can remove some of the litter boxes. Recommendations from cat experts dictate one litter box per cat, plus one extra. So if you have two cats, you should provide three litter boxes. Click here for recommendations on litter and litter boxes. As they begin to explore the house, Savannah kittens will usually be attracted to cords for a while. The phase usually lasts for only a few weeks, but those weeks can be challenging. Spraying or wiping “Bitter Apple” or vinegar on the cords will quickly discourage cord chewing. Reapplying may be necessary once or more weekly (you can also get cord protectors for exposed cords). It is also a good idea to know where your circuit breaker box is located, just in case you need to quickly cut the power. If your Savannah kitten does bite through a wire NEVER touch the kitten or try to unplug the wire! IMMEDIATELY cut all electrical power and RUSH your Savannah kitten to the nearest veterinarian or emergency clinic. Kittens are also drawn to plants. Make sure your house plants are not toxic. You can check for poisonous plants at www.ansci.cornell.edu/plants/. The curiosity and high energy of a hybrid requires the extra care you would give to a human baby in the crawling stage, and possibly then some. From today on, hide all plastic bags, including grocery bags. They are chewable, very attractive to most hybrids, and can readily cause intestinal blockage. Check for and remove all small objects such as rubber bands and chewable rubber toys, cellophane tape and plastic wrappings, ribbons and string, and small plastic objects. Frequently check toys. Toss those that are very worn or broken. Lock away medications (even Tylenol and asperin can be fatal to a cat), poisons and cleaning products. Remove or place heavy objects, vases, and other valuables in an area where your kitten won’t be injured and your precious possessions will be secure. 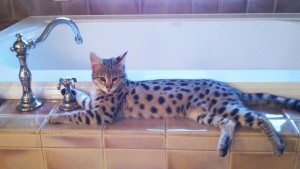 Close toilet lids, keep your Savannah kitten away from a bathtub or sink filled with water. A quick jump and a kitten may be out of his or her depth. Take care with rocking chairs, mechanical loungers, and hot stove surfaces. Be sure all small crawl spaces are blocked, floor vents included. A curious Savannah kitten will want to explore and can get caught where you may not be able to reach them. Be on guard opening and closing doors, including refrigerator and freezer, washer and dryer doors. Some Savannah kittens will try to play rough, biting or growling at toys. This is not a behavior to encourage. Firmly tell your kitten “No!” A firm tap on the nose may be necessary. A time-out session can also be very helpful. 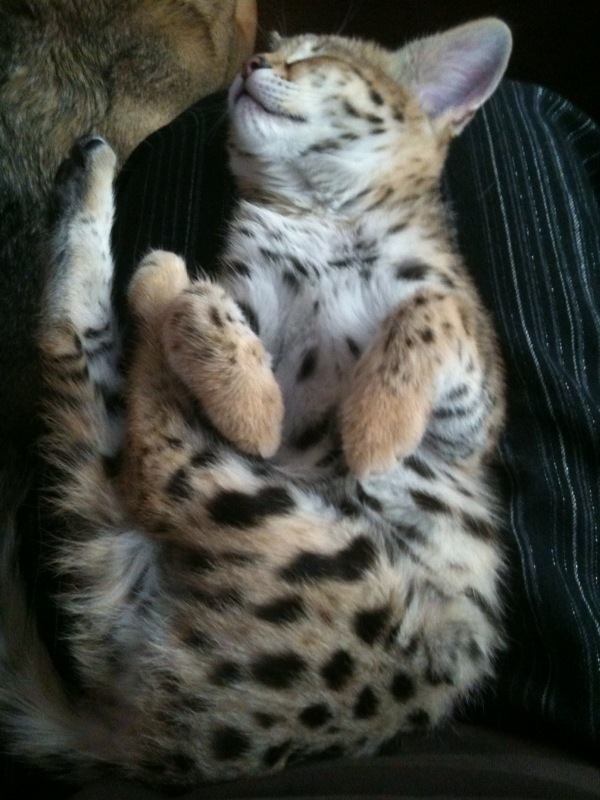 This is done by placing your Savannah kitten into their small room or into a crate/carrier for fifteen minutes or so. After a few time-outs, most kittens will understand that what they are doing will warrant punishment. Since they don’t like confinement, behavior will be curbed. We recommend the use of a squirt bottle to deter the Savannah kitten from things not allowed. Because many hybrids like water, a hint of vinegar added to the water will make it effective. Hybrid cats are very intelligent animals. Most will learn the difference between acceptable and non-acceptable behavior very quickly. So if you are consistent with your training, you will be pleased with the response. Decide on kitten's first "room"
Hybrid Savannah kittens can offer challenges. But the enjoyment and entertainment they provide is endless. Being prepared for the possible challenges will only make your relationship with your new companion more rewarding. Seeing your kitten’s eager face when you return home, so happy to see you and wanting to play, makes you look forward to the end of the day and getting home to your cat. We hope this helps give you some tips on taking care of a Savannah cat and that you enjoy every moment of preparing/kitten-proofing your home as well as training your new Savannah kitten!